UPDATE: The 2014 MTV Video Music Awards returned to the subject of Ferguson during the live show. Taking the stage to announce Drake as the winner of the Best Hip-Hop video, Common asked for a moment of silence to honor Mike Brown — who was shot in early August by an officer in Ferguson, Missouri, despite being unarmed — and Ferguson. "Hip hop has always presented a voice for the revolution," he said, before asking the crowd for silence. EARLIER: The MTV Video Music Awards are one of the most fun award shows of the year. They are always full of unpredictable moments and unforgettable performances, but with such a large audience, the award show is also a great time to make important social statements. This year, MTV is using the opportunity to air a PSA about Ferguson during the VMAs. 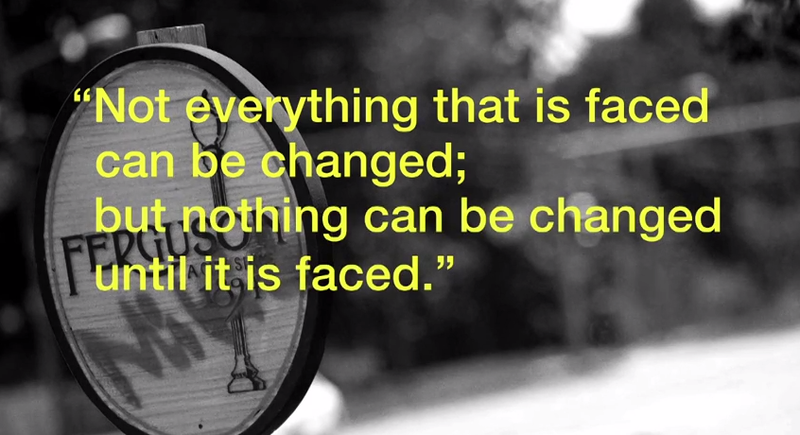 The PSA is 15 seconds long and features only a black-and-white photo of a sign in the city of Ferguson along with the James Baldwin quote, "Not everything that is faced can be changed; but nothing can be changed until it is faced". The only sound is the voice of people chanting, "Hands up! Don't shoot!" MTV’s "Look Different" campaign is here to help you erase the hidden racial, gender and anti-LGBT bias all around us. We’ll help you unlearn biases, open up conversations with family & Friends and always give you specific things you can do to make things better. MTV President Stephen Friedman backed up this statement telling The Washington Post, "Eighty percent of our audience believes that bias is at the root of racism and prejudice. But when cultural explosions like Trayvon Martin, or the recent death on Staten Island, or what is now happening in Ferguson occur, our audience often feels paralyzed to discuss the issues." MTV has always been a place where young people were able to go for the issues that are important to them. This rang true more in the old days of the channel when MTV News was more popular than reality TV shows, but seeing MTV keep the tradition alive with the Look Different campaign is a great thing. Particularly with the Ferguson PSA which is not only important, but necessary.